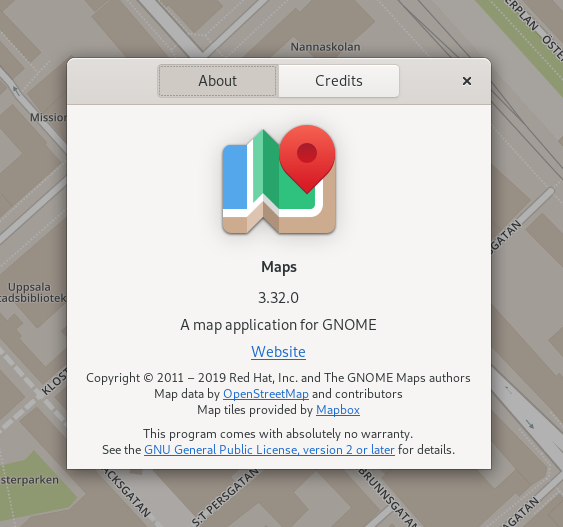 So, a couple of days ago the GNOME 3.32 release came out and I thought I should share something about the news on the Maps side of things, although I think most of this has been covered in previous posts. First up we have gotten a new application icon as part of the major overhaul of the icon style. Furthermore the application menu has been moved into a “hamburger menu” inside the main window, in-line with the other applications in the desktop. This goes hand-in-hand with the gnome-shell top bar application menu not showing this application-specified menu anymore, since it was considered not too intuitive and also few third-party apps utilized it. But I'm pleased to see that the icon of the currently focused app is still shown in the topbar, as I think this is a good visual cue there. And the other notable UI-wise fix is showing live-updated thumbnails for the in the layer selection menu for the buttons to switch between map and aerial view (contributed by James Westman). These screenshots also shows some glimpses of the new GTK theme, which I think is pretty sleek, so well done the designers! There's also been some under-the-hood fixes for silencing some compiler warnings (for the C glue library) contributed by Debarshi Ray. Looking forward I started work on an issue that has been laying around in the bug tracker since I registered it around two years ago (tagged with the “newcomers” tag in the hopes someone would take it on :) ) that is about the we use a GtkOffscreenWindow to render the output when generating printouts of a routing search. 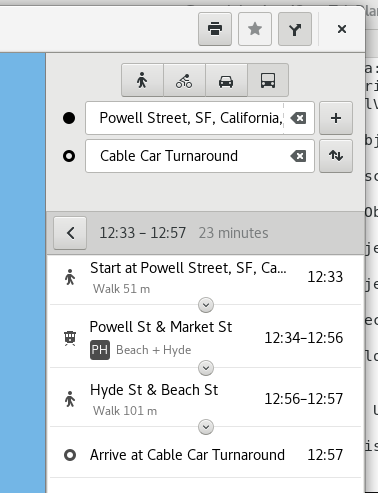 This was done by instantiating the same widgets used to render the route instructions in the routing sidebar and the attaching this to an offscreen window to render them to bitmaps. But as this method will not work with GTK 4 (due to a different rendering architecture) this has to eventually be rewritten. So I started rewriting this code to directly use Cairo and Pango to render the icons and text strings for the printed instructions. And there's some gotchas with layouting and right-to-left locales, but this far I think it's working out right for the turn-based routes as shown by the these screenshots. 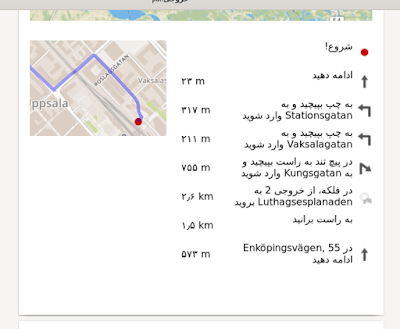 The latter screenshot showing a rendition using a Farsi locale (being RTL, using the Arabic script). 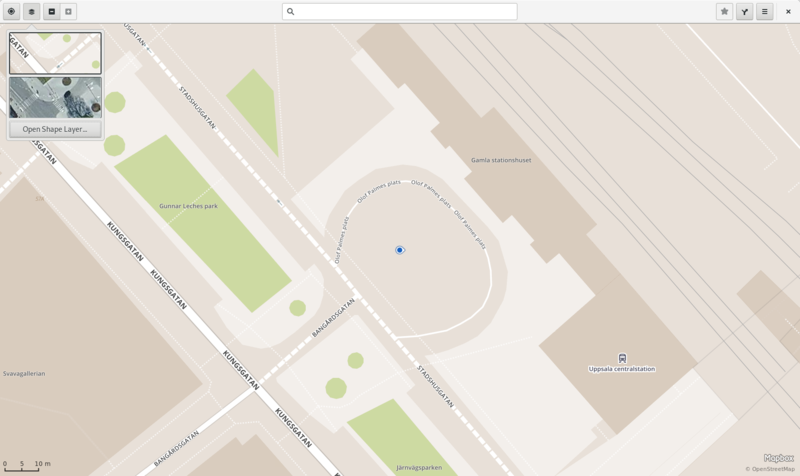 Currently in Maps, we use the libchamplain library to display the bitmap map titles (based on OpenStreetMap data and aerial photography) that we get from our tile provider, currently MapBox. This library is based on Clutter and used via the GTK+ embed support within libchamplain, which in turn makes use of the Clutter GTK embed support. 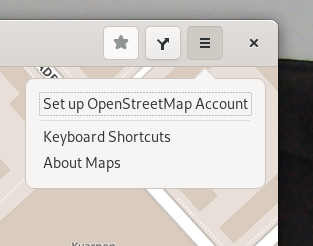 Since this will not be supported when moving along to GTK+ 4.x and the Clutter library is not maintained anymore (besides the copy of it that is included in the GNOME Shell window manager/Wayland compositor, Mutter) eventually Maps will have to find a replacement. There's also some wonky bugs especially with regards to the mixing of event handling on the Clutter side vs. the GTK+ side. So to at least get the ball rolling a bit, I recently decided to see how hard it would be to take the code from libchamplain and keep the grotty deep-down internals dealing with tile downloading and caching and such and refocus the top-level parts onto new GTK+ 4 technologies such as the Snapshot, GSK (scene graph), and render node APIs. I decided to call the new library “libshumate” in honor of Jessamine Shumate who was an artist, historian, and cartographer. So far it's not so exciting as I've only done some cleanups, based off the Meson build system port for libchamplain, removed support for the GNU Autotools build system, removed support for the unmaintained Memphis renderer library and the GTK+ Champlain widget, as the plan is to re-work the library to use GTK+ facilities directly. I've gone through all the files and renamed the API to use the new name. And rather than using something like sed, I went through all source and header files in GNOME Builder and use search and replace, this way I got to get a quick glance at the internals 😎. The next step will probably be to change the “top” class into a GTK+ widget and try getting first to just display the initially downloaded tiles using the GSK and leave out all the other functionallity at first (handling input and the overlay layers and so on). Some things have happened since the stable 3.30.0 release in September. Furthermore the application menu has moved into the new “hamburger menu ” in the title bar, in-line with changes being carried out across the board for GNOME applications, since the adoption of the desktop top bar menu for application-wide action was never really adopted in any significance by third-party applications. Another feature James has been working on is replacing our old thumbnails that was being used in the menu for selecting the map style. This has been using static graphics captured from our previous map tile provider (MapQuest) which are not only not in-line with the currenly used tile style but may also be in a legal grey-zone. So one idea I floated was to dynamically use content from the current map view for the thumbnails. We have not decided quite yet from a design perspective if we should go with this approach, but I think it looks and feels pretty sleek. 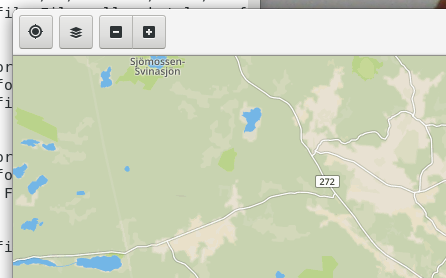 One slight downside is that it generates some additional tile accesses, but I think it´s acceptable. So thank you very much James! That´s that for now, and all have happy holidays! It´s been a while since I wrote a blog post last time… and even though we´ve had summer weather here (more or less) since quite some while, it seems appropriate with a little “start of summer” summer post. Since last time time I´ve amended a pretty long-standing issue we´ve had when running under a Wayland compositor (at least with the Mutter compositor, as used by gnome-shell) that makes the revealer widgets we´ve had for showing notifications not working in this case, as the map view is using the Clutter scene graph library and overlaying GTK+ widgets on that is not working under Wayland. 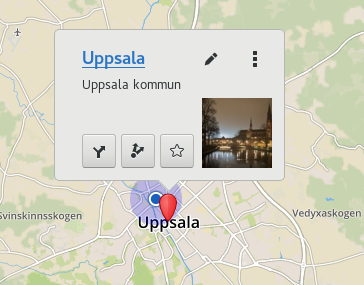 Since Clutter is deprecated and this issue won´t be fixed and re-writing the map view library using some other backend (also making it working under the upcoming GTK+ 4) is a rather big undertaking, I´ve went ahead with a few workarounds to get rid of the overlayed widgets. 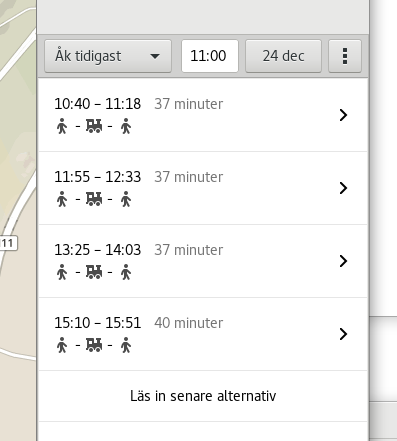 The notifications showing when routing fails for some reason have been replaced with showing messages in place of the result list. Furthermore the total number of “via points” for routing has been limited to 10. This has been done partly because GraphHopper imposes a limit of 30, and also the UI doesn´t really cope well with too many locations anyway. It's been a couple of weeks now since GNOME 3.28 was realeased. 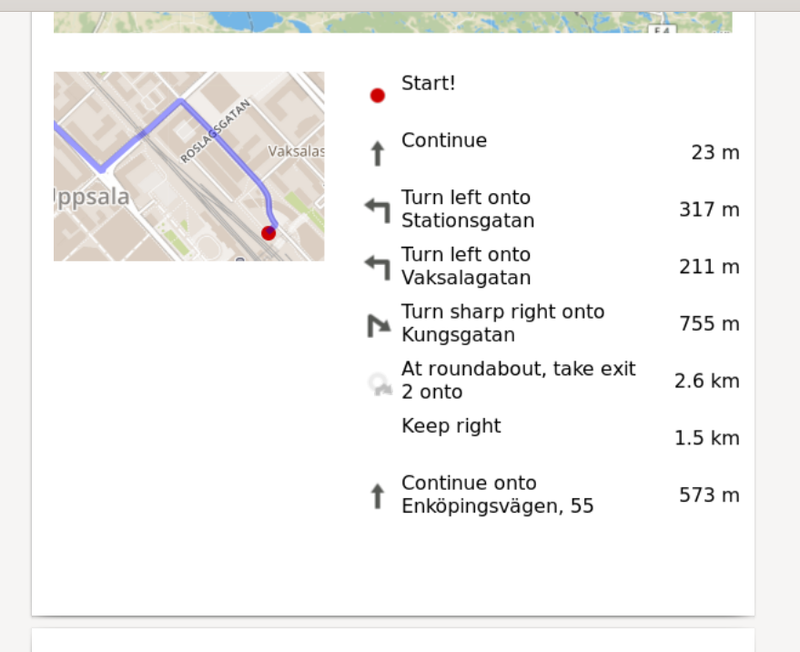 I´ve already written some about the new features in Maps for 3.28. But already now there´s some exiting news looking forward. The first is not related to code or features of Maps itself. But the project has been migrated to GNOME´s Gitlab instance (along with other projects now that mass-migration of the remaining projects from Cgit and Bugzilla is going on). I think this will simplify newcomer contributions and bug reporting quite a bit. Also the code review interface for the merge requests looks pretty nice. 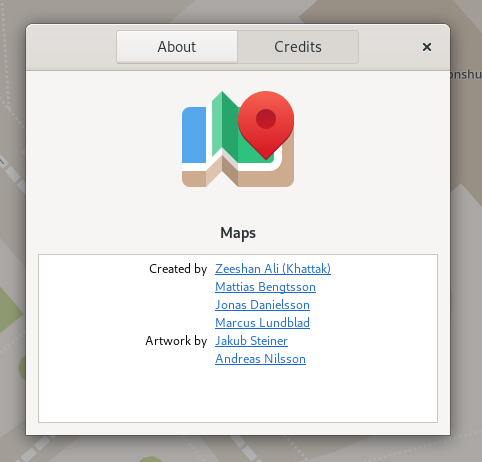 The other big news is that Maps is now built using Meson. Even though the amount of compiled code (the private C library we use for interfacing with things like libxml2 and libfolks, which doesn´t natively support GIR bindings) is quite small, I still think build times are noticeably quicker now. I decided to remove support for building using Autotools right away, since we had some shell:ish magic going with installing our icons where shell sub process ran cut to parse file names into path destinations based on splitting on underscore characters. So I took the opportunity to clean this up and move the icons into suitable directory structures directly in the repo. I didn´t think it was worth the effort to “back-port” this the Autotools build system, so from now on master can now only be built with Meson (ofcourse on the stable “gnome_3_28” branch building is done the old way using Autotools). 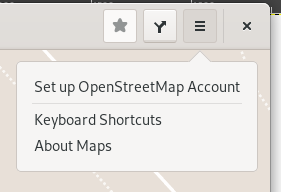 Unfortunately we where out of tile access from Mapbox for little over a week recently, but a couple of weeks ago the GNOME Foundation board has voted to set aside a budget for tiles, so things should be good now. 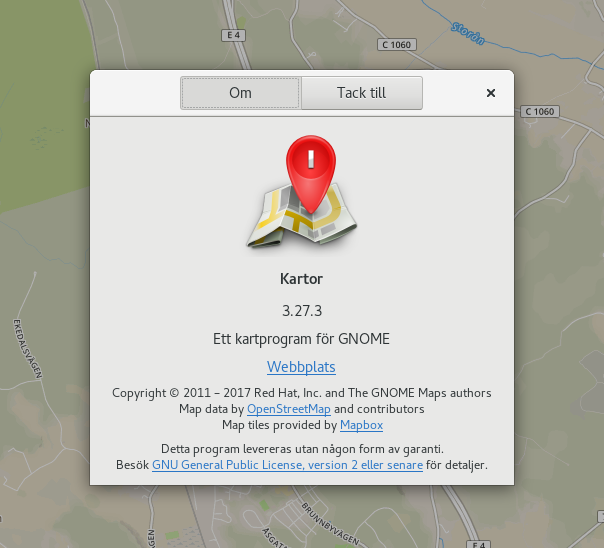 Earlier this week I´ve released GNOME Maps 3.27.90 (even though I just read an e-mail about the deadline for the release tarballs had been postponed for one week just after uploading the tarball). 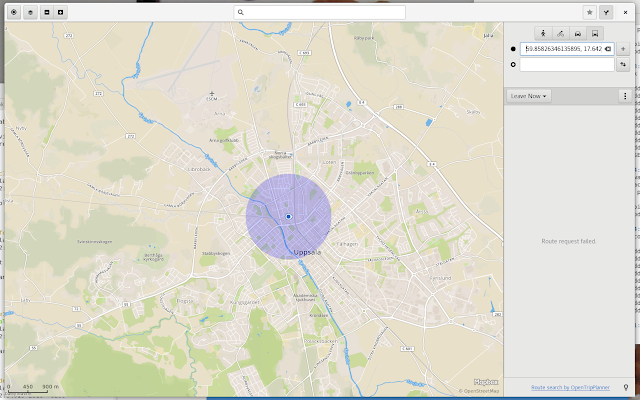 This weekend I (like some 8000 others) participated in an exciting FOSDEM with lots of interesting talks and the week before that I gave presentation of GNOME Maps, and in particular the public transit functionality for TrafikLab (the sort of “developer community” driven by the Swedish organization Samtrafiken AB, who coordinates and aggregates data from all public transit operators, both commercial/private and regional/public ones. 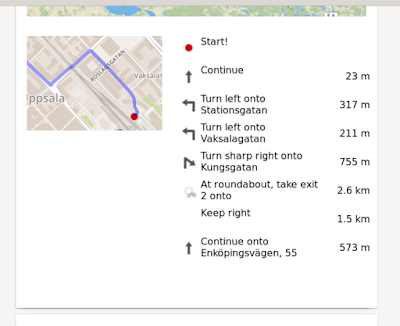 One of the larger features landed in 3.27.90, which isnt´t visible on the surface is that Maps now uses some new language features introduced to JS in the ES6 standard, namely classes and ”arrow functions”. So, when it comes to classes, as known from traditional OO languages such as Java or C++, earlier one would typically use prototypes to model object classes, but as of ES6 the language has support for a more traditional classes and with a method syntax. GJS also gained a new way to declare GObject classes. Techinically this could be done today using a transpiler step (using something like Babel) in the build system. These decorators will pretty much be higher-order functions. But I choose not to do this at this point, since we still use GNU Autotools as our build system and eventually we should switch to Meson. These changes results in a reduction of 284 lines of code, which isn´t too bad for a change that doesn´t actually involving removing or really rewriting any code. Thanks go to Philip Chimento (and Endless) for bringing these improvements for GJS! Some other changes since the last release is some visual fixes and tooltips for some of the buttons in routing sidebar contributed by Vibhanshu Vaibhav and a fix for a keyboard navigation bug (that I introduces when changing the behavior of the search entry to always activate when starting to type with no other entry active) contributed by Tomasz Miąsko. Thank you! So, we're approaching the end of the year and holidays, so I thought I should share some updates on some going-ons in Maps. The tile provider name and link is included in the service file that is downloaded on start-up, so this can be changed later on without pushing new versions (if needed). 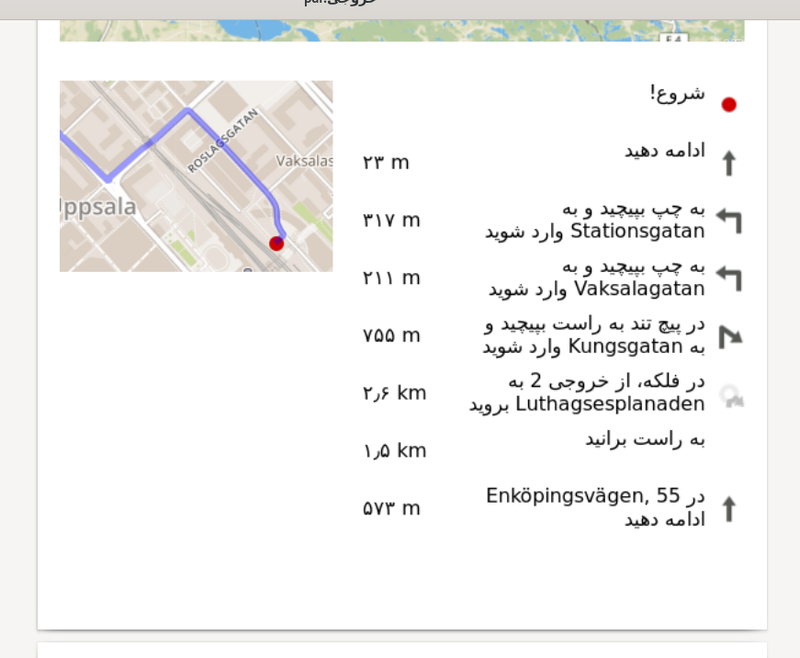 So, now we show a thumbnail picture for a location if it has a Wikipedia article linked to it in the OSM data, and if the Wikipedia API gives us a thumbnail corresponding to the article. This is yet another area where you as a user can add value by adding Wikipedia links, and also by uploading article title images to Wikipedia. 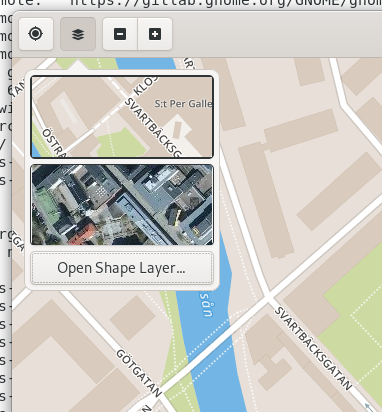 Another thing that has come up lately is an issue with how we overlay some things (like the zoom control buttons) using a GtkOverlay, which unfortunatly doesn't play well with the LibChamplain-based Clutter view used to display the map background when running under a Wayland compositor. I think this is actually pretty nice, and I think I prefer this over the overlayed zoom buttons. So, I think we should probably keep this even if the GtkOverlay problem is solved (or we move away for using Clutter). 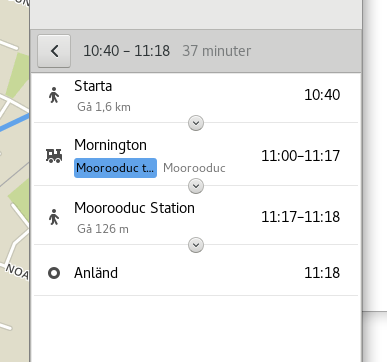 This example shows routes for the Mornington heritage railway outside of Melbourne in Australia, as the data I usually use for showcasing from the Swedish Samtrafiken organization currently unfortunately doesn't have this classification (I've bugged them about it…).